FRESNO, Calif. (KFSN) -- UPDATE: The rocket launch has been scrubbed until at least December 30. Just a few minutes before the launch was supposed to happen, people in different parts of California saw a brilliant zigzagging light streak in the sky. At 5.47 this evening, keep an eye on the sky. There's a good chance the skies above the Valley will be lit up on Wednesday evening with a spectacular light show. But don't mistake it for a meteor shower or a comet - that awe-inspiring sight is a rocket launch. 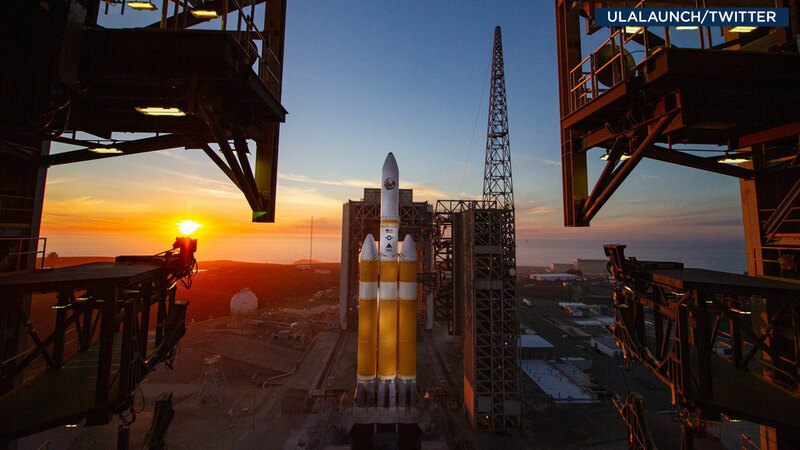 The Delta IV Heavy - a rocket carrying spy satellites into orbit - is scheduled to be launched at 5:44 p.m. at Vandenberg Air Force Base in Santa Barbara County. People in Fresno and surrounding areas will likely see the rocket as a streak of light in the sky or as clouds of puffy smoke a few minutes later. It will be visible across much of southern California, depending on cloud cover. The United Launch Alliance is keeping its fingers crossed that conditions are favorable and nothing goes wrong before liftoff. The launch of the classified satellite for the U.S. National Reconnaissance Office has been aborted three times before this for different reasons -- the last time due to high winds. Let's hope fourth time's a charm!